FALL. IS. HERE. And it’s hot in LA so it doesn’t feel like fall yet, but that’s not stopping me from getting in the spirit with this cute AF wreath. I’m a little bored of faux foliage wreaths, so I decided to create something that will last longer than fresh flowers, but feels just as chic as live blooms. Also, my friends at FabFitFun invited me to demo this wreath live on their Facebook Page, so click here check it out! Without further ado, let’s make this wreath! 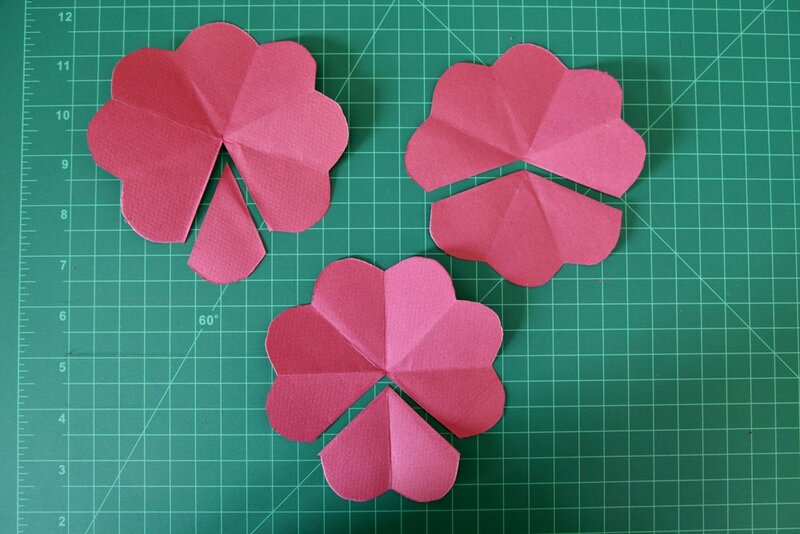 Step 1: To make a single paper flower, you’ll need to cut three square pieces of cardstock. To make this wreath I used 3”, 4”, 5” and 6” flowers. This pink one I’ll demonstrate here is a 5” square. Step 2: Fold each square in half diagonally so it forms a triangle. Then repeat this two more times until you have a small triangle. Step 3: Identify the corner of your triangle that, if you were to unfold it, would be the center of the square. 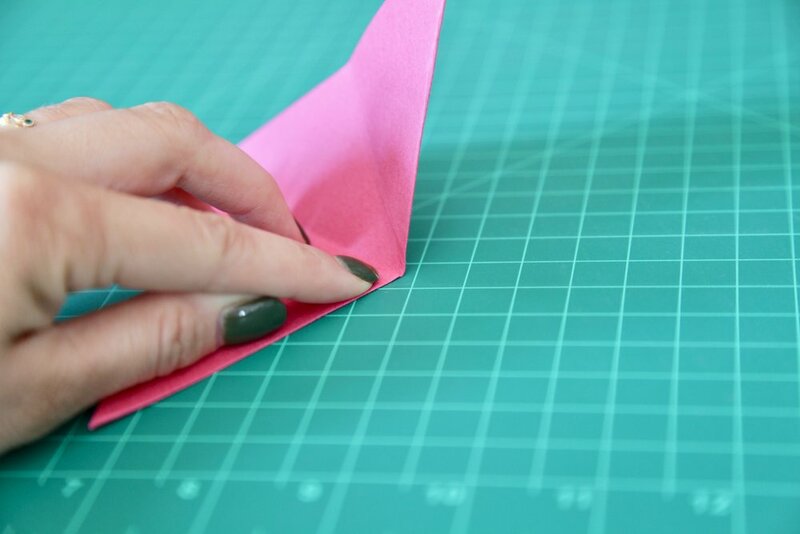 Step 4: With the corner you just identified pointing down, use scissors to cut your triangle into a cone shape (I don’t know about you, but this looks just like a sno-cone to me, and it helps me to visualize that when I’m cutting!). Step 5: Once you’ve cut the three triangles into cones, unfold them! They look cute! Use scissors to cut one petal out of one flower, a chunk of two petals out of another flower, and chunk of three petals out of the third flower. Keep all of these, you’ll use them. Step 6: Fold the smallest piece into a tight cone and hot glue it together. Then, take the next smallest piece and roll it into a cone and glue to secure. Continue following this pattern until all of your flower parts are glued. For the larger pieces, use your fingers to smooth out the creases before you glue them together. Step 7: Use your fingers to gently roll the edges of the petals outwards (this works best on the larger cones, it won’t work well on the three smallest so don’t bother with those). Step 8: Hot glue the pieces together, starting with the smallest and working your way to the largest. It works best to apply a little glue to the bottom of the smaller pieces and position them inside the larger pieces, holding each piece together for a few seconds until the glue has a chance to set. For some reason, I’ve found that gluing the third piece into the fourth is the trickiest: this step takes a little more glue and a little more patience to get right, so take your time and don’t get discouraged! Step 8: Once you’ve made all the flowers you want, hot glue them to the inner wooden hoop (don’t forget to glue on some faux leaves). I unfortunately don’t have any helpful pictures to guide you through this process, because it turns out that gluing paper flowers to a hoop is a two handed job and I didn’t have any hands left to take photos! My advice for this step is to start on one side and just keep building, gluing on one piece at a time and waiting for it to harden before you move on to the next. Don’t be shy about using a ton of glue on the back to make it sturdy, no one will be looking at that part! I found myself gluing each flower to the hoop, and then turning it over and adding more glue at the points where flowers were touching each other (just to make it more sturdy). Also, another good tip is to lay it all out before you start gluing so you have an idea of what flowers look best in each spot. And that’s it!! The flowers are a little time consuming, but once you get the hang of it they go pretty quickly. Let me know if you make this, I’d love to see pics.